My kids have had homemade costumes since they were born. 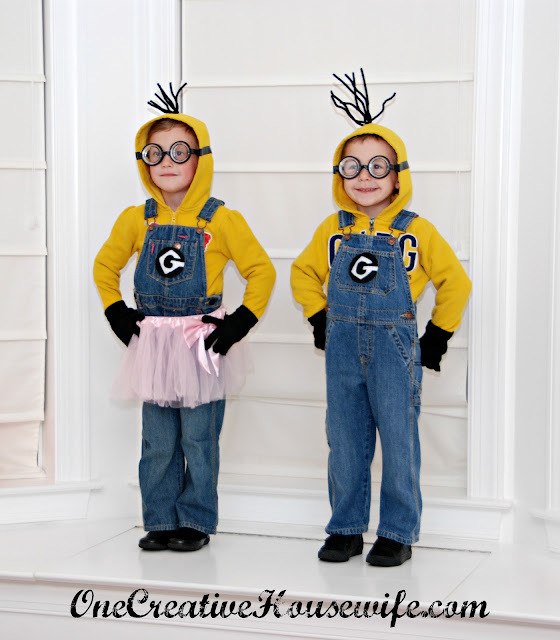 This year they wanted to be Minions from Despicable Me. 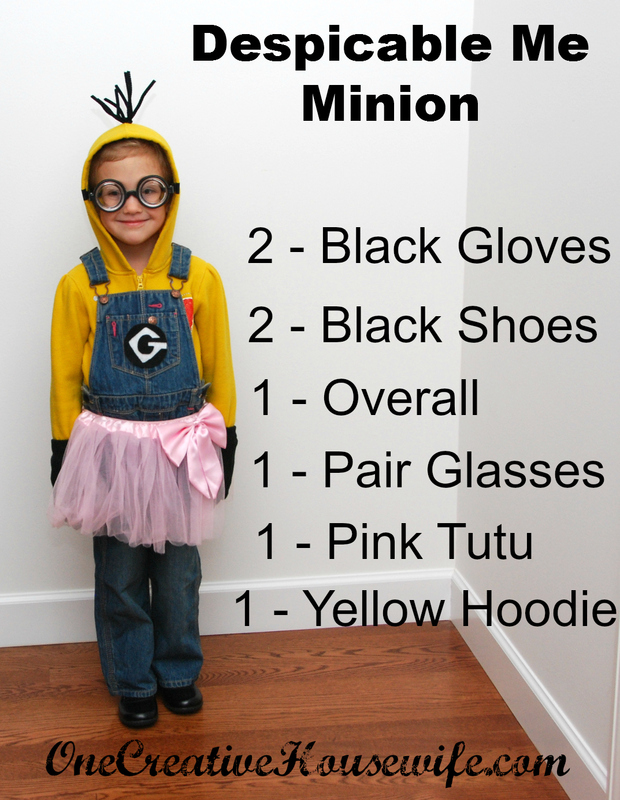 In one scene of the movie, there is a minion dancing with the little girls and it has a tutu on. The second my daughter saw that, she needed to have a tutu with her costume. I think these were the easiest costumes I have made to date. 1. 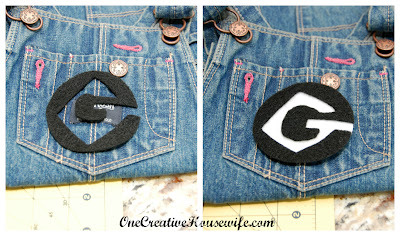 Cut the "Gru" symbol out of black felt. (I freehand cut the symbol.) When I placed it on the overalls I thought it wasn't noticeable enough so I added a circle of white felt behind it. 2. Attach "Gru" symbol to the white felt with fabric glue. 3. Attach the symbol to the overalls. I sewed it on with large stitches that just went though the white felt,so I would be able to remove it after Halloween. You could use fabric glue for this as well. The glasses would not stay on my kids' faces, so I had to make a band for them. 1. Tie black elastic to one the arms of the glasses. 2. Place the glasses on your child and tie the other end of the elastic to the other arm of the glasses. 3. Hot glue the elastic in place, so you won't have to keep tying it on. 1. Cut pipe cleaners to desired length for hair style. 2. Sew the pipe cleaners to the top of the hood using the black thread. Mine took about 8 stitches for the shorter hair and 15 for the longer hair. You could glue the hair on as well, but I wanted to remove it after Halloween. 3. Place the sweatshirt and glasses on your child. 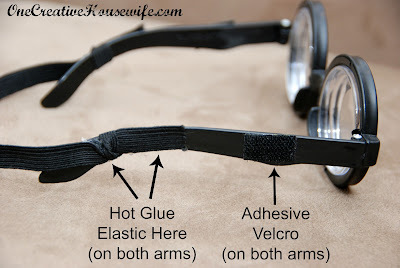 Attach the electrical tape around the hood where the hood meets the glasses. After all your pieces are made, you are good to go! 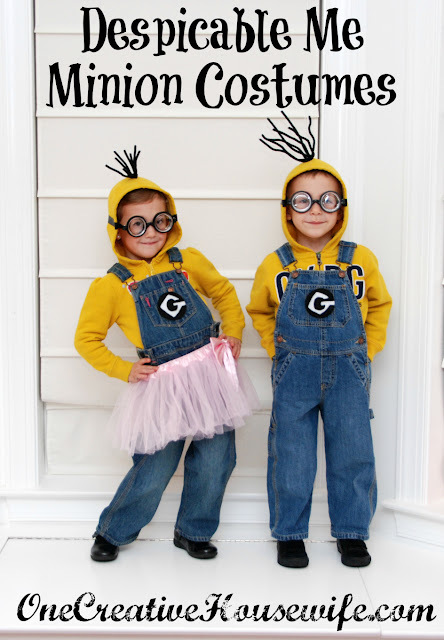 And if you sew everything on, after Halloween you child has a new hooded sweatshirt and overalls. 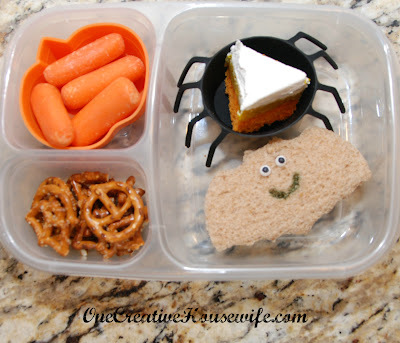 If you have to send your child to school with their costume, you could do something like this to help make sure all the pieces make it back to you. 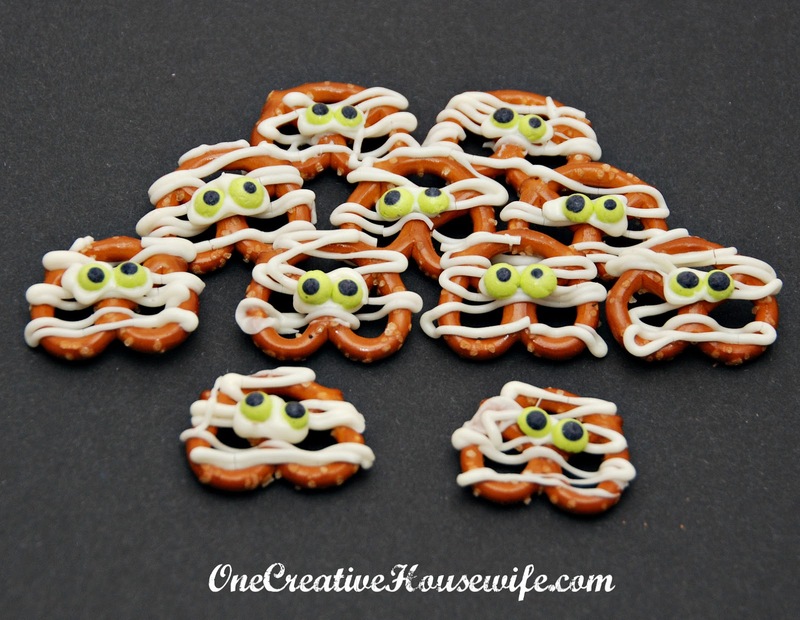 It is hard to believe that Halloween really isn't until next week, because this week has been full of Halloween treats, parties and a parades. 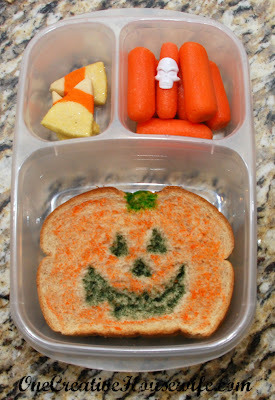 Thanks to all the Halloween activities this week every lunch my daughter had this week had a Halloween theme to it. I packed her a bat shaped Nutella sandwich with candy eyes, carrots, Halloween pretzels, candy corn sugar cookie bar, and a Capri Sun. She had a candy corn bread Nutella sandwich, carrots, applesauce, a candy corn marshmallow, and a Sistema Twist N' Sip* of water. I packed her buttered noodles with carrot eyes, apple slices, and a Sistema Twist N' Sip* of water. She had a Halloween shaped mini pancakes and syrup, grapes, carrots, candy corn sugar cookies, and a Capri Sun. I used Americolor food markers* to make a pumpkin themed Nutella sandwich, carrots, candy corn sugar cookies, and a Capri Sun. 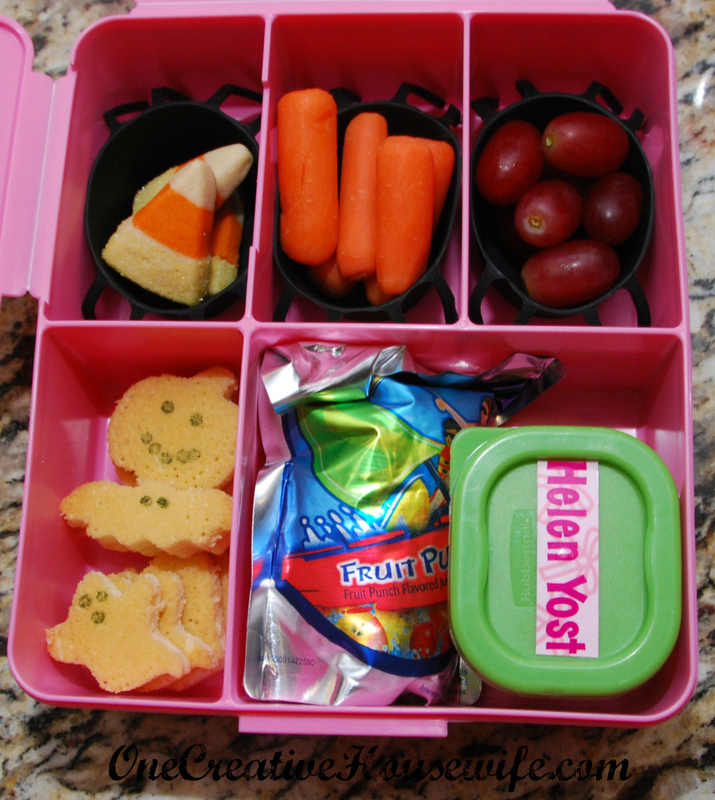 The little container with a green lid is the Rubbermaid LunchBlox sauce container*. 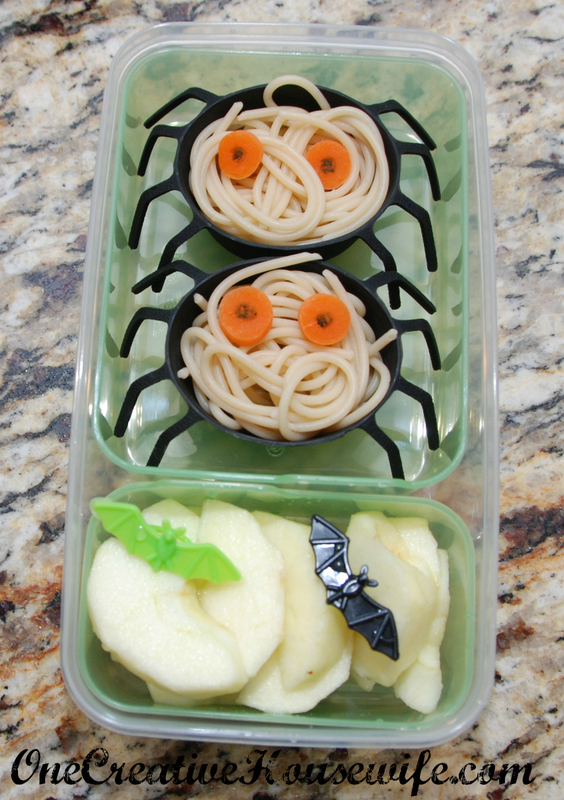 The skull and bat rings are from the Target Halloween section. 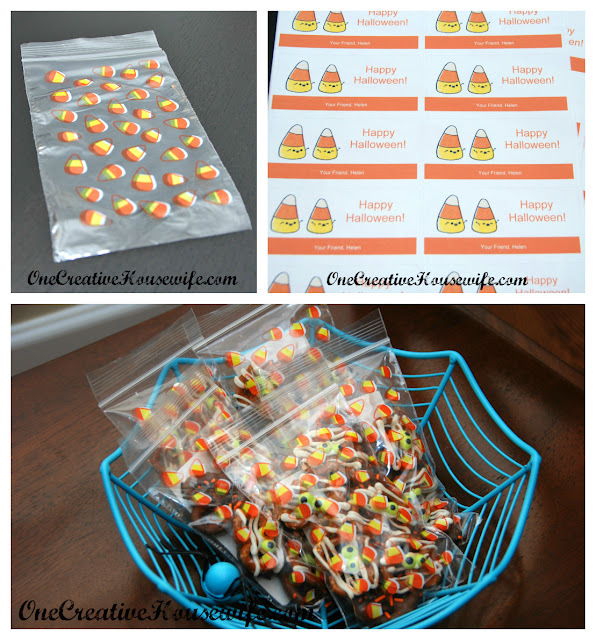 Hello, my name is Andrea and I am addicted to candy corn themed items. 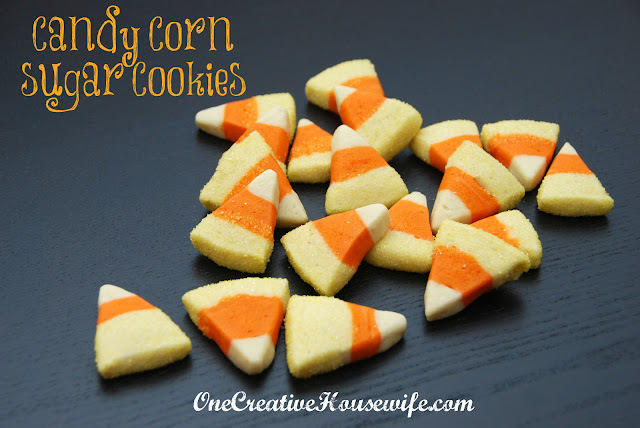 These cookies are super easy to make. You just have to plan ahead a little bit because you do have to chill the dough. 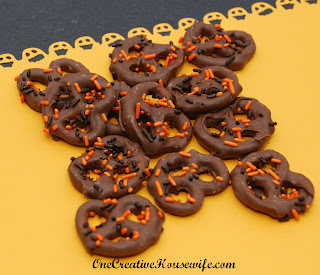 I needed a lot of cookies for several different Halloween parties; so I doubled the below recipe, and used an 11"x7" pan instead of a 9"x5" bread pan. The doubled recipe gave me almost 350 cookies, that are 1 3/4" long. 1. 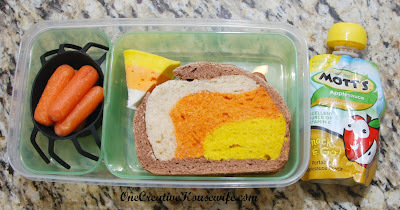 Line a 9"x5" loaf pan with plastic wrap or wax paper. 3. Add egg, and flavoring, and whip until light and fluffy. 4. Mix in salt, and baking soda. 5. 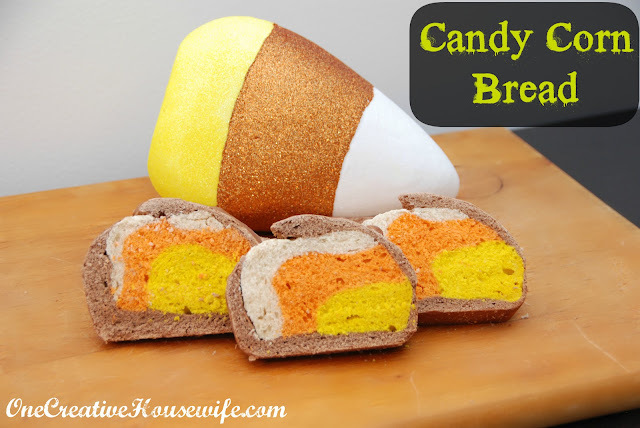 Mix in flour, until combined. 6. Once the dough in mixed, separate into 3 equal sections. 7. Dye 1 section of the dough orange. Do not dye the other 2 sections of dough. 8. Flatten 1 section of the white dough into the bottom of prepared pan. 9. 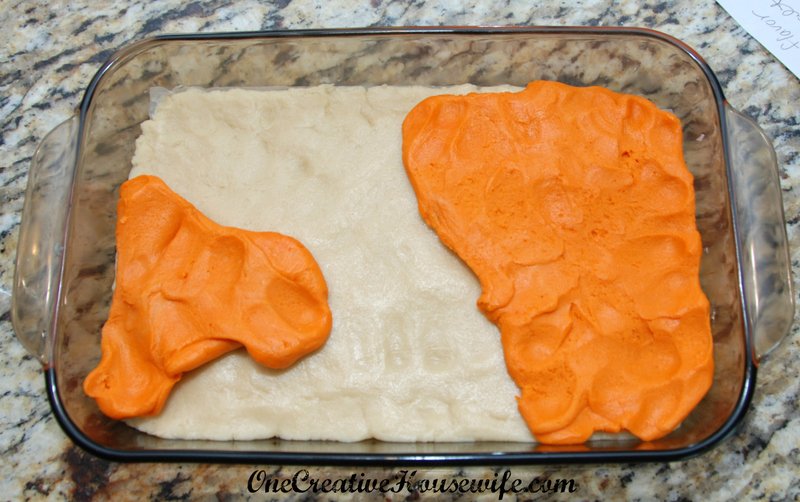 Press the orange layer on top of the white layer in the pan. I find that this is best accomplished by flattening smaller section of the dough in your hands and piecing it together in the pan. 10. 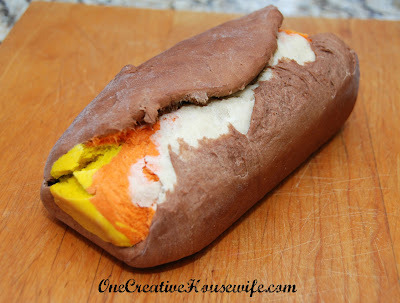 Press the second section of white dough on top of the orange layer. 11. 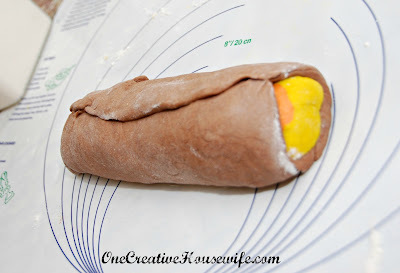 Cover the dough with plastic wrap, and chill in the refrigerator, preferably overnight. 12. Preheat oven to 375 degrees. 13. After chilling remove dough from pan and cut into candy corns. 14. 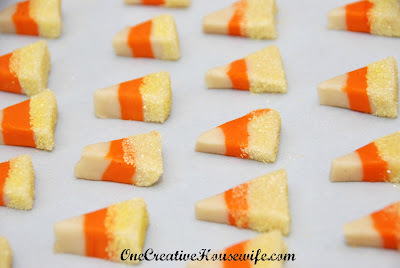 Dip the bottoms of the candy corns into the sanding sugar. 15. 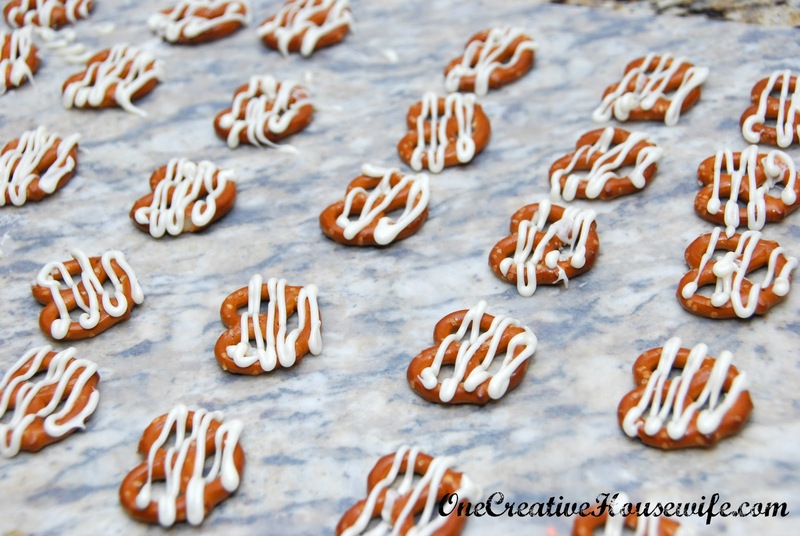 Bake on a parchment paper lined cookie sheet for 7-10 minutes. 16. 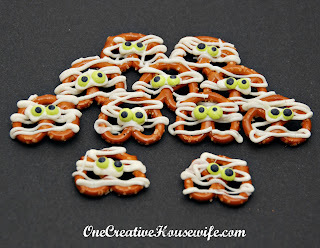 Cool on cookie sheet for 2-3 minutes. Then move to a wire rack to completely cool. 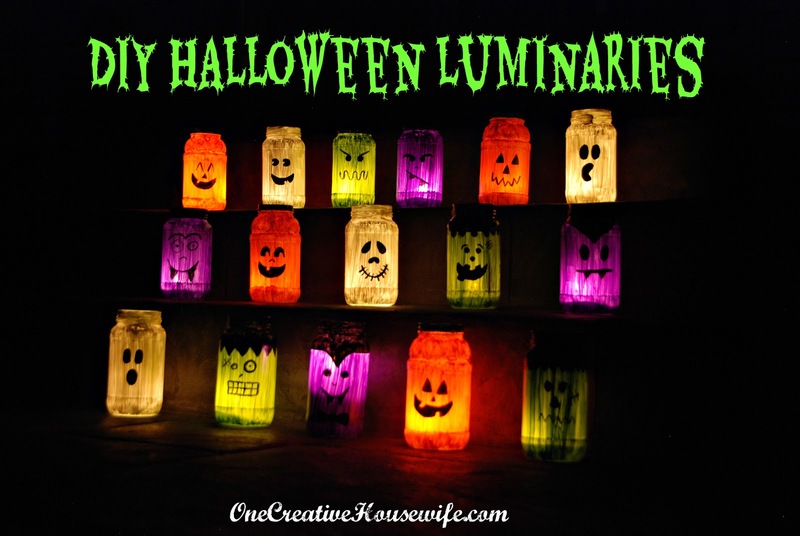 I am always looking for fun ways to decorate the outside of our home for Halloween. Last year I came across some Halloween luminaries by Crafts by Amanda. 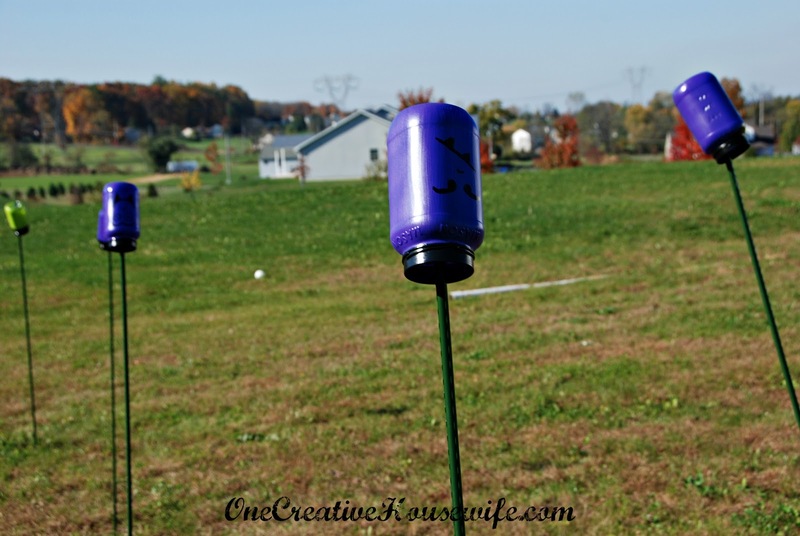 She used some canning jars she had purchased, but my motto is, why buy what I already have. So I have spent a year saving jars and getting jars from people to paint. 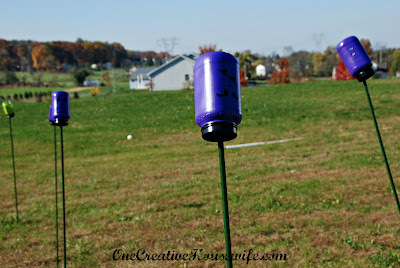 The jars I used for the green, white, and purple luminaries are from Great Value salsa. 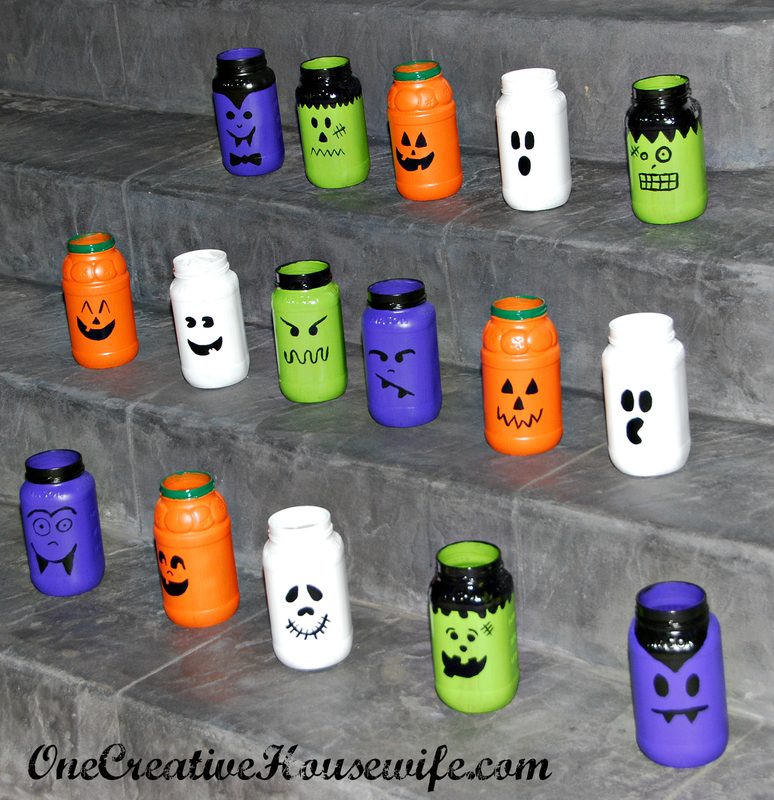 The orange jars are from Francesco Rinaldi pasta sauce. 2. 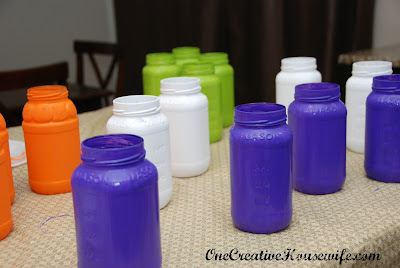 Once the jars were dry, I painted 1 coat of the acrylic paint on them. 3. 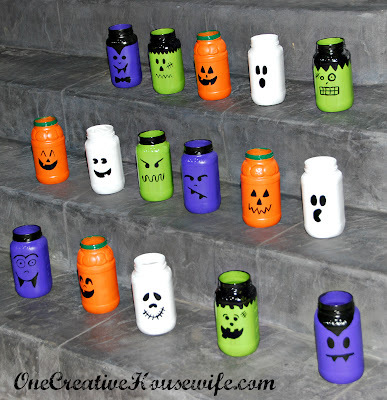 After the paint has dried, paint your faces on the jars. You could draw your faces on with a Sharpie and paint them in, but I just free handed my faces with black paint and a paintbrush. 4. 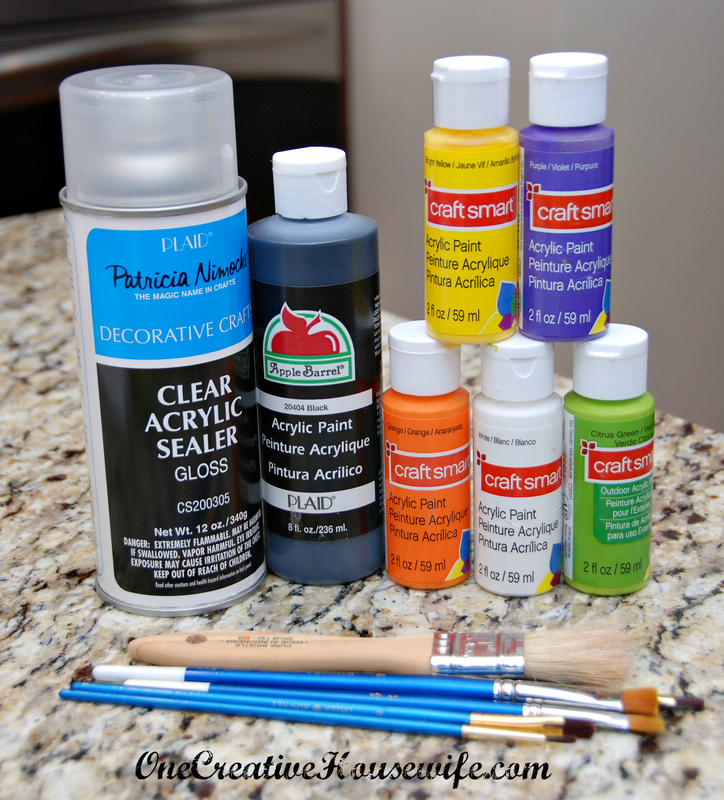 Once your paint is dry, spray the jars with the clear acrylic sealer. This will prevent the paint from chipping easily. I used tomato sticks and placed the jars on them and then sprayed them with the clear acrylic and left them there to dry. You can use any candles you want, but I used tea lights. This past weekend was a great weekend. There were birthday parties, friends, family, and a cookout over the fire pit; it was just an over all fun, relaxing weekend. And what good is time spent around the fire pit if there aren't any s'mores? Right? 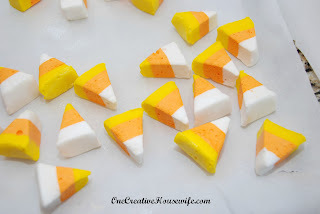 These candy corn marshmallows taste just like a regular marshmallow, but make Halloween s'mores a little more fun! Friday, I decided to make my first attempt at making homemade marshmallows in preparation for the weekend. 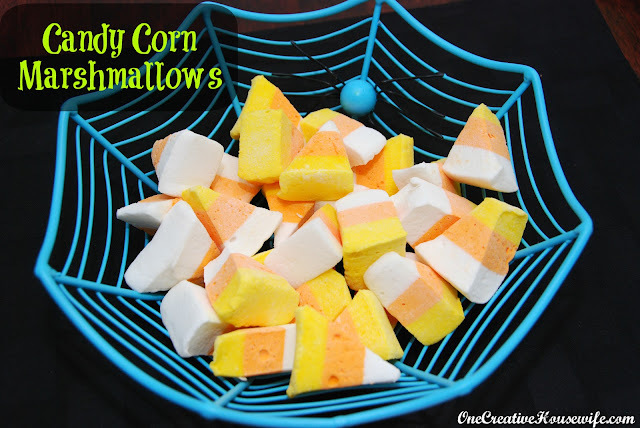 I figured why try plain white marshmallows when I could make them look like candy corn. Well, attempt number one ended in tears, and marshmallow in the garbage. By the time I was attempting to spread the 3rd layer of marshmallow it had already set up and would not spread at all. After altering Haniela's process a little bit attempt number two was a success!!! I'm not sure if it was because it was my second attempt, or if it was because I laid out a very strategic plan; but attempt number two was sooooooooo much easier. I know the recipe looks really long but it is not very complicated. Basically you are doing the same thing three times. I just wanted to spell it all out step by step so marshmallow rookies (like myself) might have an easier time with it. Plus, next year when I make these again and look back at the recipe I'll know what I did. 1. 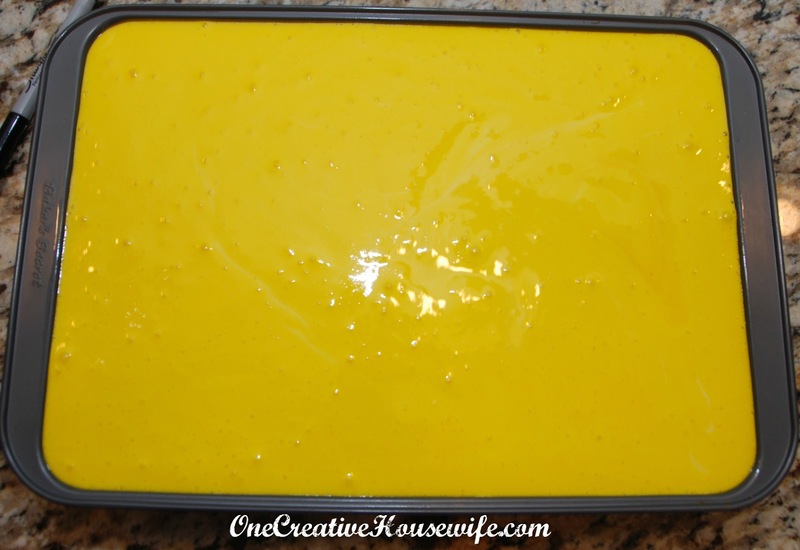 Spray the bottom and sides of a 9"x13" baking pan with cooking spray. 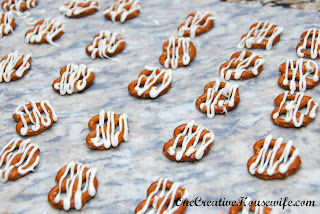 Line the bottom of the pan with parchment paper and spray the parchment paper lightly with cooking spray. The pan I used was a Bakers Secret 9"13" metal pan and all three layers came right to the top. 2. In the bowl of a standing mixture (You could use a hand mixer, but when working with hot sugar I prefer a standing mixer.) sprinkle the gelatin over 1/2 cup cold water. Swirl and let stand to allow the gelatin to soften. 3. In a 3-quart saucepan heat 1/2 cup cold water, salt, sugar, and corn syrup over medium-low heat. Stir it with a wooden spoon until all the sugar is dissolved. If necessary use a pastry brush to brush the sides of the pan with water. 4. Increase the heat to medium-high and boil the mixture, until a candy thermometer reached 250 degrees. (Keep an eye on the sugar mixture, because you don't want to have to deal with cleaning up burnt sugar.) If necessary use a pastry brush to brush the sides of the pan with water. 7. 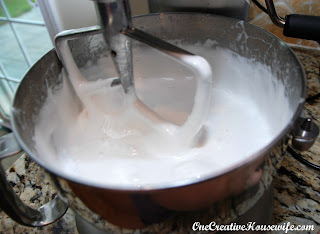 In a standing mixture (You could use a hand mixer, but when working with hot sugar I prefer a standing mixer.) beat on high speed until the mixture is white, thick, and almost tripled in volume. The mixture begins to look like marshmallow fluff. 8. In a separate bowl, beat the egg whites (or meringue powder and water) until you get stiff peaks. 9. Add the egg whites and vanilla to the sugar mixture and beat until just combined. 10. Pour the mixture into the prepared pan, and set aside. 1. In the bowl of a standing mixture (You could use a hand mixer, but when working with hot sugar I prefer a standing mixer.) sprinkle the gelatin over 1/2 cup cold water. 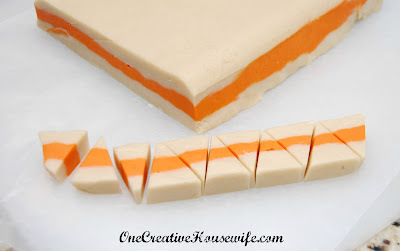 Swirl and let stand to allow the gelatin to soften. 2. 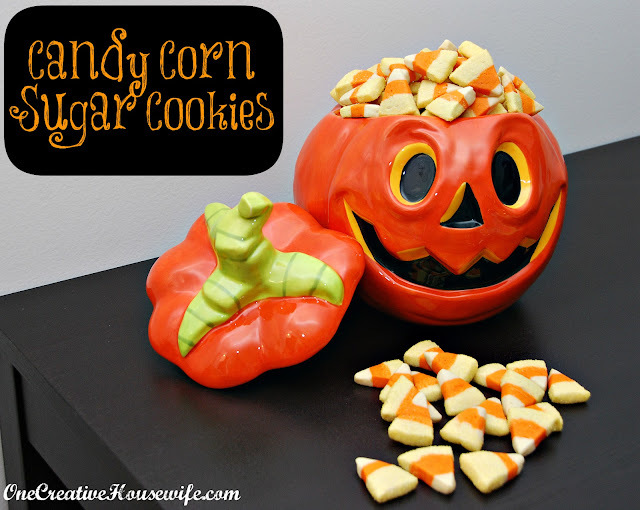 In a 3-quart saucepan heat 1/2 cup cold water, salt, sugar, and corn syrup over medium-low heat. Stir it with a wooden spoon until all the sugar is dissolved. If necessary use a pastry brush to brush the sides of the pan with water. 3. 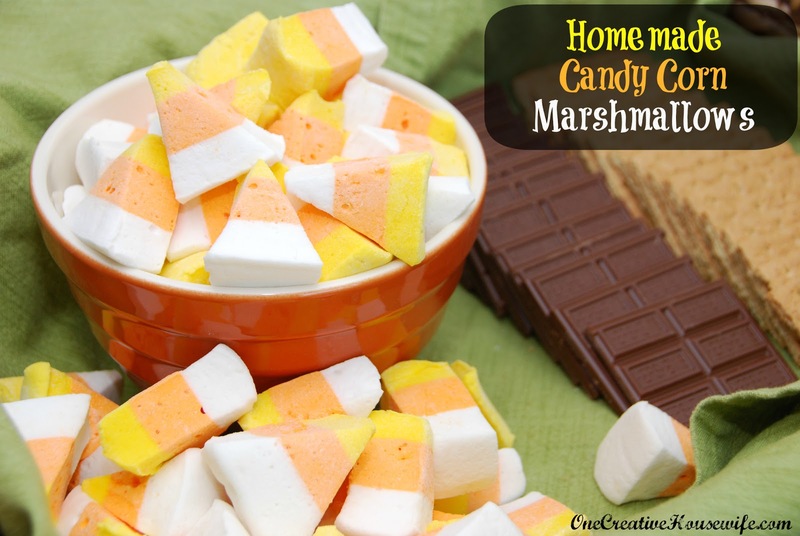 Increase the heat to medium-high and boil the mixture, until a candy thermometer reached 250 degrees. (Keep an eye on the sugar mixture, because you don't want to have to deal with cleaning up burnt sugar.) If necessary use a pastry brush to brush the sides of the pan with water. 6. 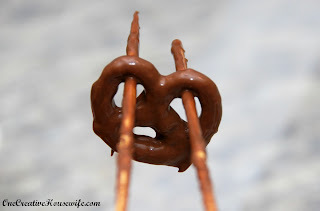 In a standing mixture (You could use a hand mixer, but when working with hot sugar I prefer a standing mixer.) beat on high speed until the mixture is white, thick, and almost tripled in volume. The mixture begins to look like marshmallow fluff. 7. In a separate bowl, beat the egg whites (or meringue powder and water) until you get stiff peaks. 8. Add the egg whites, vanilla, and orange food coloring to the sugar mixture and beat until just combined. 9. Pour the mixture into the prepared pan over the white layer, and set aside. 8. 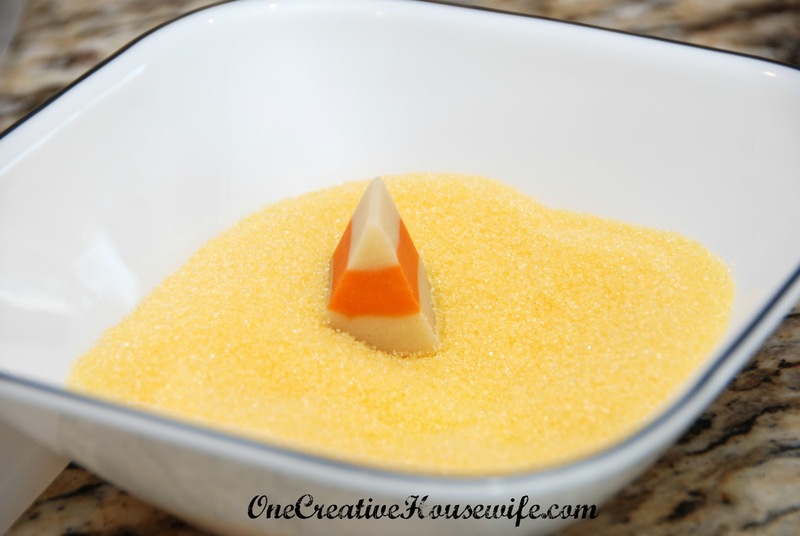 Add the egg whites, vanilla, and yellow food coloring to the sugar mixture and beat until just combined. 9. 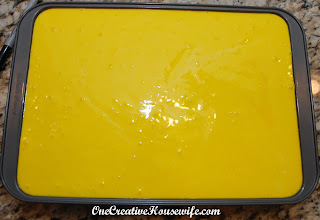 Pour the mixture into the prepared pan over the orange layer. 1. Cover a cutting board with parchment paper, lightly spray with cooking spray. 2. To unmold your marshmallows, run a knife (sprayed with cooking spray) around the edges of the pan. 3. Invert the pan onto the parchment covered cutting board. The marshmallow comes out pretty easily. 4. Peel off the parchment paper that came out of the pan. 5. 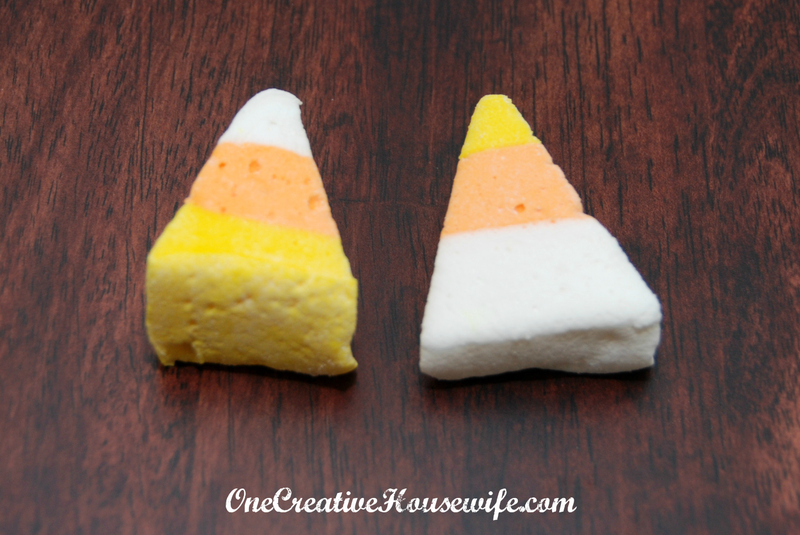 Cut the marshmallow into desired shape with a cooking spray coated knife, pizza cutter, or cookie cutter. 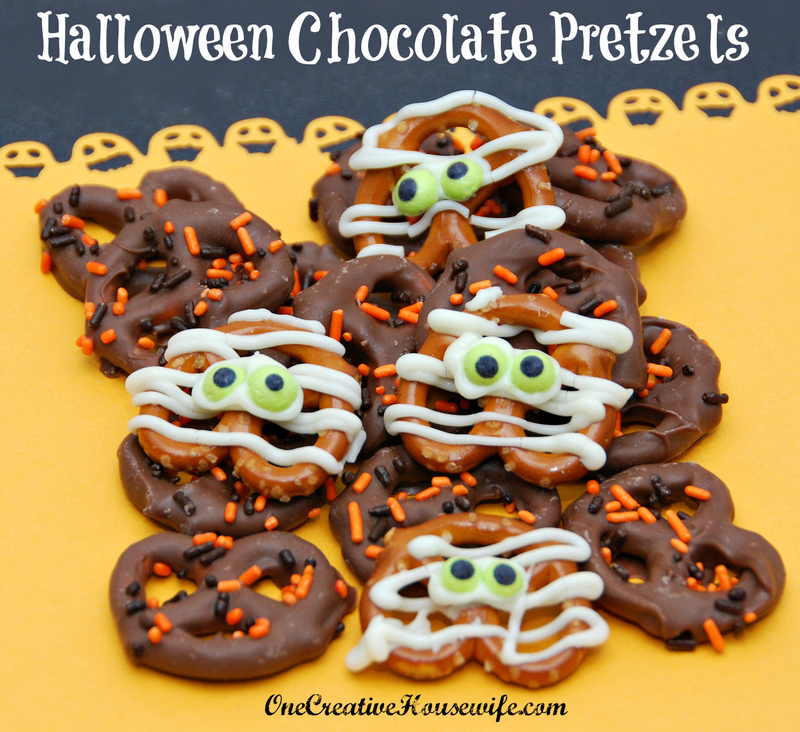 You could do cubes, triangles, or whatever shape your cookie cutter is. 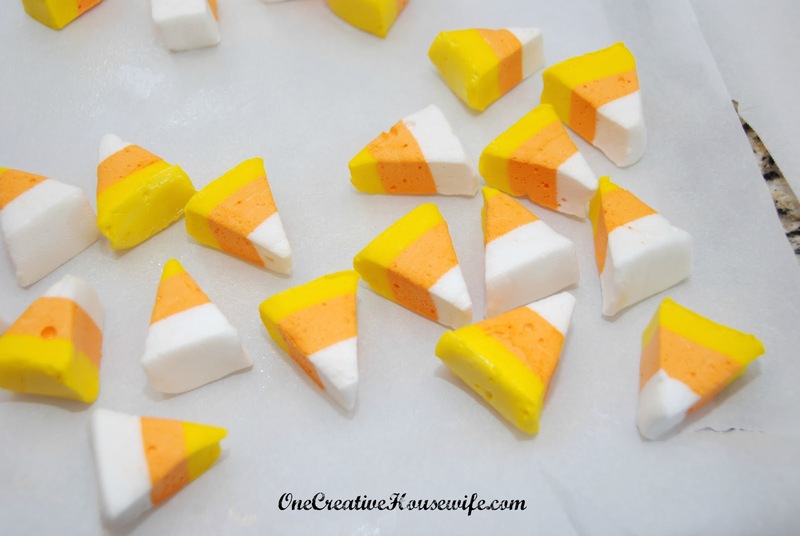 If you do triangles some of your corn will be white-orange-yellow and some will be yellow-orange-white. 6. In a medium large bowl mix the powdered sugar and cornstarch. 7. Coat each marshmallow completely. 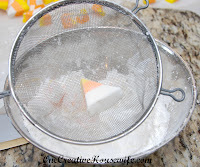 Then place the coated marshmallow in a metal sieve and shake off the excess. 8. The marshmallow can be stored in an airtight container for up to a week. The marshmallows were great in the S'mores. 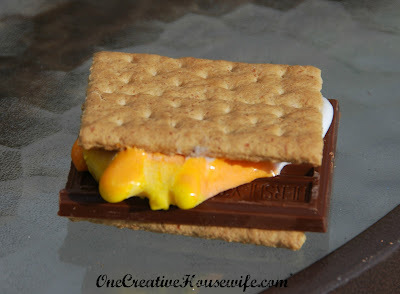 The kids were really excited to see the different colors in their s'mores and the taste is absolutely delicious!